Many of my clients need to make data that lives on one server available on another server. There are many reasons for such a requirement. You might want to speed up cross-server queries by providing a local copy of the data. Or you might want to make the data available to resource intensive reporting queries without impacting the OLTP load, maybe even with an intentional delay so you’re always reporting against complete days only. Finally, you might be looking to implement high availability. In all these situations, SQL Server Replication is a viable option to look at when planning for the implementation of such a requirement. 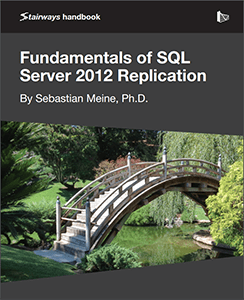 Sebastian Meine, PhD is a principal trainer and consultant with sqlity.net llc. He specializes in T-SQL performance and SQL-TDD and shares his passion and knowledge regularly with audiences world-wide.